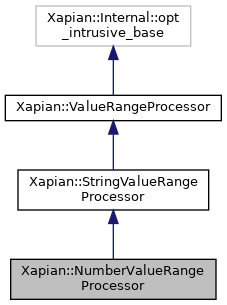 Use Xapian::NumberRangeProcessor instead (added in 1.3.6). str_ A string to look for to recognise values as belonging to this numeric range. The remainder of both strings defining the endpoints must be valid floating point numbers. (FIXME: define format recognised). For example, if str_ is "$" and prefix_ is true, and the range processor has been added to the queryparser, the queryparser will accept "$10..50" or "$10..$50", but not "10..50" or "10..$50" as valid ranges. If str_ is "kg" and prefix_ is false, the queryparser will accept "10..50kg" or "10kg..50kg", but not "10..50" or "10kg..50" as valid ranges. Check for a valid numeric range. If BEGIN..END is a valid numeric range with the specified prefix/suffix (if one was specified), this method modifies them by removing the prefix/suffix, converting to a number, and encoding with Xapian::sortable_serialise(), and returns the value of slot_ passed at construction time. Otherwise it returns Xapian::BAD_VALUENO.